Resources and leadership for the realtor community. As the authoritative association for realtors, NAR provides members and users access to their exclusive institutes, societies, and councils. They are thought leaders in all aspects of the residential and commercial real estate industries, acting as the trusted industry resource for the realtor community. 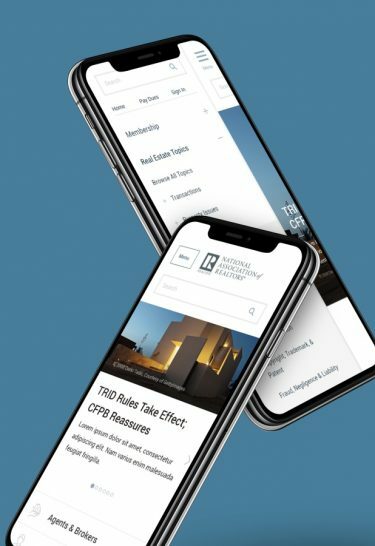 NAR’s original goal was to bolster their position as a valuable and prominent resource for realtors to help guide users more seamlessly through the depth and breadth of their authoritative content collection. 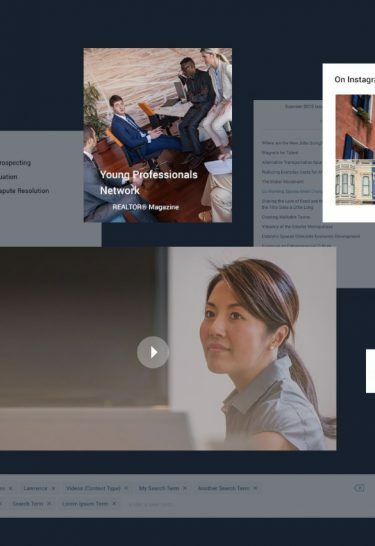 Bolster their position as a valuable and prominent resource for realtors by seamlessly guiding users through the depth and breadth of their authoritative content collection. NAR was able to increase memberships and resource utilization through their redesign. dashboard map showcasing emergency response vehicles, shelters, and American Red Cross response sites filtered by disaster. A comprehensive content slider approach. The large body of content that needed to presented on the website created a distinct challenge for WDG designers. The site needed to relay a large amount of content without creating visual clutter. As a solution, we created a three-point slider with multiple manners of displaying content to keep scrolling at a minimum. Strategy also incorporated targeted links within the homepage content to guide users towards available resources and key pages. 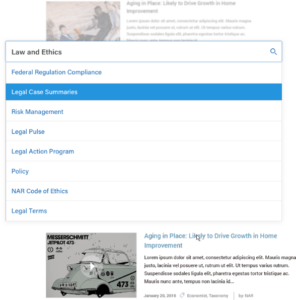 Design also created a custom scroll within the primary slider that allowed users to open related content within a frame without leaving the page. Essentially, this window permitted users to explore related content without leaving the primary page or overwhelming the user. One challenge WDG’s team faced was uniting NAR’s various properties with a streamlined navigation. We consolidated the login info for these different sites to eliminate discrepancies, allowing users to easily navigate backwards, even from microsites. WDG partnered with NAR’s internal research team, who provided valuable strategy documents and early reviews for user tests as potential site solutions. The initial prototypes were designed to aid the user in the quest for both resource acquisition and content exploration. As members pay dues or get print cards through the site, the administration needed to be as simplified as possible. We therefore created primary nav and footer wireframes with clear paths for users to identify themselves as broker, realtor, or other. The initial tests were performed by NAR’s UX team at a conference; based on the feedback of those tests, we recommended a revised solution. Realizing the need to pivot and readdress user experience, we placed the self-identification element in the primary nav instead. 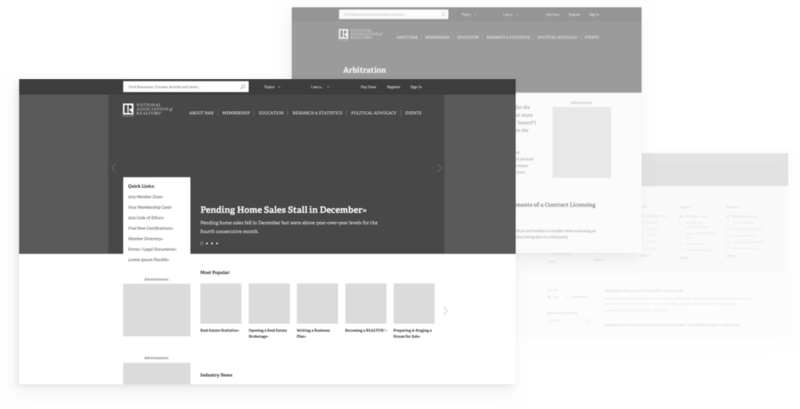 WDG created a custom search bar to best promote target audience engagement, emphasizing resource allocation through a federated search solution. Within this deliverable, specific search component requirements and multiple rounds of revisions helped created a high-level of detail suited to a premier user experience. To complete the navigation structure, an incredibly robust footer was built with segmented information for members and the general public, as well as sections which introduced all other properties. This area of the footer was global across all properties, while other sections were unique to the properties they were on. Lastly, a flexible section was built to be dependent upon the property the user is on. These specifications challenged WDG designers to determine the location of particular elements, as well as which portions were global versus unique to the property. NAR requested that our team incorporate advertisements seamlessly within the content. As the content needed to be displayed in a variety of ways, we utilized a horizontal scroll feature which displayed more content for a smaller real estate. We also added video incorporation for trending topics, designing a space that worked within the grid proportions with ads, content, and video. WDG designers also created a custom, responsive calendar system with alerts and a listview that incorporated ads. The search had refinement built into the initial design, with sorting functionality and hierarchy within results. Lastly, we created custom profile pages that needed to balance bios, contacts, ads, and certifications.